I’m excited to be writing my very first blog post for InspyRomace, and I’m thrilled to be in the company of such great writers and readers. By way of introduction, I thought I would share with you the story of how I ended up here, right where God wants me. It was the summer of 2011. I had been a published author for eleven years, but I was struggling with where my writing career was going. Three publishing companies had believed in me enough to release my books, but I had never achieved the readership that would make me a successful writer. Eight books, several different genres — I was trying to find my niche, a place where my writing style – my voice – was a natural fit. I was a needle in a haystack. If someone found my books, they usually enjoyed them. And sometimes they sought out more. But in the huge market of contemporary romance, I had to face reality: my books were … forgettable. One thing I knew: I didn’t want to quit writing all together. Writing was such a huge part of my life that I couldn’t imagine life without it. BUT (and this was a big but …) I didn’t see the point in going down the same path I’d been on. Write another entertaining, but easily forgettable contemporary romance novel. I desperately needed to make a change for the better. So I started brainstorming. What did I want to create? A story that makes people feel good. A story that will be remembered long after it is finished. A few weeks of letting my brain mull this over, and I had the beginning premise of a story. At my son’s baseball game, I said to Anne, a fellow-mom and also an avid reader, “What do you think of this as a story? 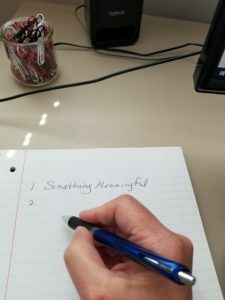 Would you want to read something like this?” I pitched the story: a woman in her 50’s who thought that life was all set – long-term marriage, successful teaching career, ambitious daughter – only to discover that everything was falling apart. Her husband strayed, her marriage was ending, her school year was coming to an end, and her daughter accepted an internship out of the country. All that spread out in front of her was a long, empty, lonely summer. To fight depression, she hits the road. No destination in mind, just follow the path where God leads her. She discovers that as broken and devastated as we are, God can use our unique skillset to help others He places in our path. After following God’s will, the woman realizes that what started out to be the worst summer of her life, turns into the best. So, a budding excitement in my heart, I took the idea and expanded on it. Leslie Malone was born, as was her ex-husband Tim, her daughter Jasmine, all the characters she met along the way, and of course, eventually, Hank Harrison who turns out to be the love of her life. Once I’d gotten that far, I prayed. I was going to be writing an inspirational romance. But I couldn’t do it without help and guidance from my Father. I prayed about this story. I prayed about my writing career. I felt like I was on the verge of something big, and God placed enthusiasm in my heart. I made a deal with God (smile). I told Him that if He wanted me writing Christian fiction, He needed to guide the right readers to me. I had spent eleven years becoming the best writer I knew how to be. I’d sharpened my shovel, I’d practiced and perfected my trade. Now, I would be writing for Him. He just needed to put the books in front of those people who needed/wanted to hear the message. Ten finished inspirational romance novels later, I still pray that prayer every day. Did it work? Yes. I call this series Pawleys Island Paradise, because it takes place in the coastal South Carolina town where my family vacationed every summer. A little piece of heaven, in my humble opinion. It took off and expanded into seven books before I moved onto my next series, just down the road geographically, Murrells Inlet Miracles. Now I’m firmly settled into my brand: Heartwarming, life-changing Christian fiction. And they all take place at the beach. God was true to His word. These books reach people every day, and they mean something to people. They help people who are going through similar issues as my characters. Heartfelt reviews and personal messages from readers about my beachy heartwarming reads remind me that God cares about what I’m doing here. And it sure makes me feel good to be right where He wants me to be. Have you ever made a “deal” with God? What was it about and how did you feel Him working in your life? **Heartwarming, life-changing Christian fiction. ** An award-winning author, Laurie is living her dream life at the beach, writing novels. Laurie writes beachy inspirational romance that takes place in the South Carolina Low Country. She retired from the big day job and now focuses on writing full time. Strolls on the sand, soaking up the sun and riding the waves can be considered the best kind of research. 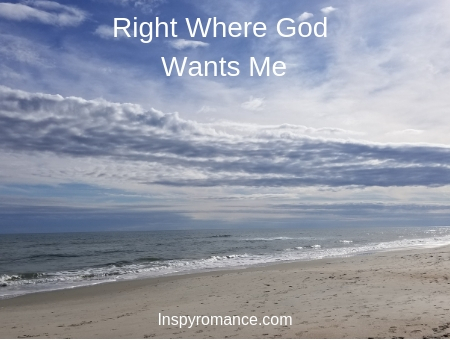 Hi Laurie, welcome to inspyromance:) Thanks so much for sharing your writing journey- and how God has and continues to lead you. I’m not sure if I have ever made a ‘deal’ with God… that is definitely something I will ponder though. I do believe God is working in my life, I see His guidance when I reflect and remember, and pray that He continues to guide and direct my path. Hi Wemble! Thanks for the welcome! Hi Laurie! Welcome to Inspy Romance! You are a new author to this avid reader. Your first book in Murrells Inlet Miracles is in my To Read pile. As a Michigander, living on the pristine sandy beaches of Lake Michigan with romantic sunsets, I enjoy beach reads. As a teen when urged to do Christian service, I dealt with God that I did NOT want to be a missionary in a foreign land. As a young adult after meeting my husband, I did NOT want to be a pastor’s wife. Hubby and I served in three churches before he retired. God won out here. My main ministry was to be a teacher. God and I also had many a discussion about where I would teach. As I aged, I mellowed. God opened the right doors at the right time. God is in control. Let go and let God – became my motto. Best wishes. Enjoy the weekend. Hi Renate! So happy to get to meet you through InspyRomance. I love your obedient spirit to the Lord. It sounds like you’ve had a lot of wonderful experiences. I love Michigan. My brother and his family lived there for awhile, and they bought a boat. Within an hour drive they could hit up to a hundred lakes! Amazing! Welcome. Glad you have joined us. Thanks for the welcome! So happy to be here! Welcome! Glad you write as God leads. That is a blessing to me as a reader. I don’t think I’ve ever made a deal with God but have had doors open and close as I go through life. Things aren’t always as I planned but God blesses and provides. Hi Diana! So glad to meet you! Welcome to Inspy Romance, Laurie! I loved your Pawley Island books and have read your first Murrells Inlet… I think just the first one, so far! We’re really happy to have you here. Hi Valerie! So happy to be here. Thanks for the invite! Hello, Laurie!! Wow, this book sounds good!! I’ll be putting your books on my wish list!! I’m 50 something, too, and can relate to what you’ve written on the blog! I’m caregiver to my Mom. I used to joke with her that I’d be the one to quit work and stay with her. When it happened, it wasn’t unexpected. I didn’t have to quit, as God worked it out that I was laid off. It’s been an adjustment for both of us, though. Not the same circumstances as your book, but definitely just as life changing! Trudy, thanks so much for your comment! Yes, it sounds like the next chapter of your journey is a life-changing, unexpected chapter! I wish you much love and satisfaction in the place God put you, helping the woman who has taken such good care of you. Love and hugs to you. I’m looking forward to getting to know you and your books! I think when I was a lot younger I may have tried to make deals with God, but not recently. Hi Ellie! Thanks for the note! Welcome Laurie! I visited Murrells Inlet a few years ago and loved the area. That is such a pretty stretch of beach through there. Hi Jessica! I so agree! After spending the majority of my life in the midwest, I can’t quite believe I’m lucky enough to live here! So good to have you with us, Laurie! I loved reading how your inspy (and indie!) career came to be! Well hello there Autumn! So happy to be joining you! Welcome Laurie! We can use all the Christian writers we can get and I love reading about older couples finding love also. Hi Pam! So nice to meet you! Welcome and congrats on your first blog post here. Bless you. This is a most wonderful and uplifting post. Thank you for being open with us. It is such a powerful reminder that we need to do everything for Him and through Him. I have never made a deal with God. Growing up this was a no-no. And as I got older, I found it some how just didnt feel right to do. But honestly, I have been tempted. Thank you Lori! So nice to meet you. Welcome. So nice to have you here. Thank you so much for sharing. Hi Lucy! So nice to be here. Thanks for your comment. That is such a neat story! I love knowing how authors come up with their book ideas. Thanks Dianna! So nice to meet you! Hi Laurie. Thanks for sharing your story. Looking forward to get to know you and your books better. Hey Laura! Thanks so much! Great to meet you! Laurie, I’m so glad to find you here! I found your books quite by accident when some were discounted on Kindle, and then had to go back for more! Here’s the really neat thing – my books take place in the Litchfield Beach area, right there at Pawley’s Island! We vacationed there and would definitely live there if I could! Thanks so much for this post – I needed a little nudge today! Wow! Hi Regina! What a small world. I’m going to have to look up your books! I love reading about the Lowcountry. Hi Narelle! Thanks for the welcome and your kind comment.